The TV world again turned on its head in 2010. Let's get right to our annual countdown of what had viewers buzzing. 10. Hotsy totsy -- Eighty-eight-year-old Betty White became the year's Golden Girl at an age when most formerly able-bodied Americans are gumming creamed corn. A determined Facebook campaign led to her becoming the oldest-ever host of Saturday Night Live, for which she won an Emmy. White also returned to prime-time in the TV Land sitcom Hot In Cleveland while guest-starring all over the place. Throw in a heavily replayed Snickers Super Bowl commercial for good measure. 9. Here a Palin, there a Palin -- Former Alaska governor Sarah Palin warmed up for a likely presidential run with a TLC reality series -- Sarah Palin's Alaska -- that found her allegedly roughing it alongside expert guides and a camera crew. Meanwhile, her daughter, Bristol, unaccountably hoofed and puffed her way to the finals of ABC's Dancing with the Stars while Mama Grizzly beamed from the studio audience. 8. 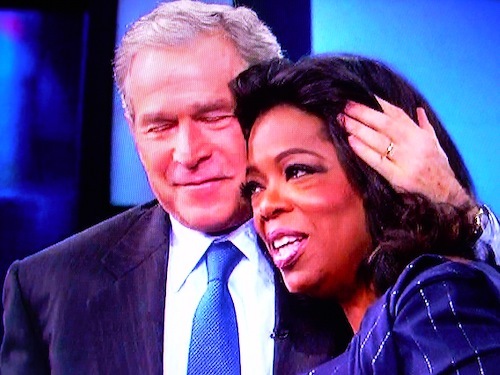 Bush book tour hooks networks -- Former president George W. Bush returned to the public eye in a big way with his nationally televised book tour on behalf of Decision Points. He began with NBC's Matt Lauer before getting comfy with Oprah Winfrey and downright chummy with Fox News Channel's sycophantic Sean Hannity. CBS, ABC and CNN also bit, with Bush snubbing only MSNBC. Which was to be expected. 7. Ends of days for a pair of Jacks -- Two of prime-time's all-time string-alongs ended their long and winding roads in May. On Fox's 24, Kiefer Sutherland's physically and emotionally battered Jack Bauer was last seen heading overseas (from where a big-screen movie is supposed to originate). 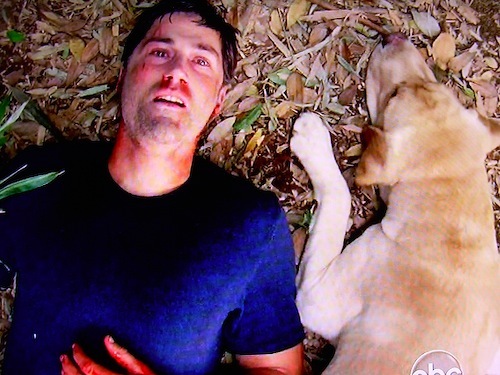 And on ABC's Lost, Matthew Fox's physically and emotionally battered Dr. Jack Shephard expired on the island before ascending to a heavenly reunion with his former plane-mates. The Lost finale was shredded by some acolytes for failing to tie up a wide variety of loose ends. 24 simply ran out of even remotely plausible new ways for Jack to save the world. 6. He's sorry, so sorry -- Tiger Woods at last came out of seclusion in February via a closely controlled nationally televised mea culpa attended by his mother and assorted friends. "I brought this shame on myself. It's up to me to start having a life of integrity," he said as part of a lengthy prepared statement. Then it was on to the Masters tournament, with TV analyzing and covering virtually every swing and expression. 5. LeBron-athon -- "I'm going to take my talents to South Beach," LeBron James told interviewer Jim Gray after making a spectacle of himself on an elongated ESPN special that was ripped by just about everybody. James' decision to leave the Cleveland Cavaliers was deemed understandable by many. But the manner in which he announced it took his image straight into the toilet. Or so the pontificators said. 4. Juan is the loneliest number -- NPR's knee-jerk dismissal of Juan Williams for comments he made on Fox News Channel's The O'Reilly Factor ignited a firestorm of criticism from virtually everywhere except MSNBC. In short order, two of its hosts, Keith Olbermann and Joe Scarborough, received hand-slap two-day suspensions for making contributions to political candidates. FNC immediately signed Williams to a new contract after his comments about feeling uneasy when on a plane with passengers in "Muslim garb." FNC personalities predictably called for an immediate end to all taxpayer funding of NPR. But by the end of the year, that argument had seemingly lost its punch. 3. King abdicates throne on sinking CNN -- Larry King ended a quarter-century run on CNN with his December 16th sign-off on Larry King Live. The once dominant all-news network, which also recently dismissed president Jon Klein, has fallen behind both Fox News Channel and MSNBC in the prime-time Nielsen numbers. Its new Parker Spitzer hour, which premiered in the fall, has been widely panned and little-watched as the network almost desperately seeks to re-invent itself. King's replacement, Britisher Piers Morgan, is due in January. He'll also keep his other job, as the alpha judge on NBC's hit summer series, America's Got Talent. 2. Idol adds and subtracts while ratings retract -- The most powerful series in TV history, Fox's American Idol, had a bruising year that began with judge Simon Cowell's January announcement that he'd be leaving the show after May's finale. With its ratings and relevance slipping, Fox responded by re-hiring former executive producer Nigel Lythgoe while sacking judges Ellen DeGeneres and Kara DioGuardi. Their replacements, Jennifer Lopez and Steven Tyler, eventually signed on after protracted off-and-on contract negotiations. Host Ryan Seacrest and charter judge Randy Jackson are the only constants as Idol nears the Jan. 19th start of a very pivotal Season 10. 1. Late night tilt-a-whirl -- The year began with Conan O'Brien leaving NBC's Tonight Show behind rather than succumb to the network's plans to have a half-hour Jay Leno comedy show precede him after late night local newscasts had ended. 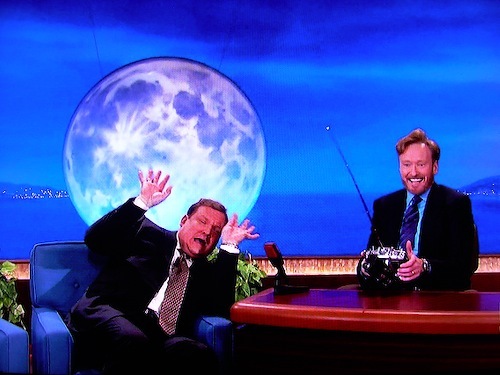 Leno's prime-time debacle and O'Brien's slipping Tonight ratings had prompted another ham-handed attempt to somehow restore order. No one expected O'Brien to wind up at TBS, with Fox seen as his most likely new home. But Conan surprisingly became a TBS reality in November while the network's incumbent Lopez Tonight went quietly to a later hour. Leno's Tonight re-do lately is falling flat after an initially strong start while CBS' Late Show with David Letterman has drawn even. But both are being beaten by ABC's Nightline. So who's laughing now?